Are toxic algal blooms the new normal for Australia's major rivers? You are here Home > In-stream Habitat > Are toxic algal blooms the new normal for Australia's major rivers? 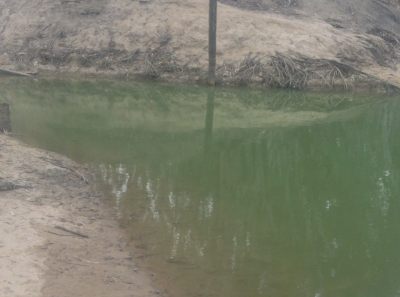 For much of this year, up to 1,700 kilometres of the Murray River has been hit by a serious outbreak of potentially toxic blue-green algae, which has flourished in the hotter-than-average conditions. After three months, the river is now recovering with the arrival of wet weather. But we are unlikely to have seen the last of these poisonous microbes. Large blue-green algal blooms are a relatively new phenomenon in inland waterways. In 1991 an algal bloom affected more than 1,000 km of the Darling River, the first time such an event had been reported in an Australian river, and one of the few times internationally. It was an environmental disaster, killing livestock and striking a telling blow against Australia’s reputation as a clean, green farming nation. The response was decisive: a state of emergency was declared, and the bloom ultimately gave rise to significant investment by state and federal governments into freshwater research, particularly in the Murray-Darling Basin. Fast forward two and a half decades to the latest bloom afflicting the Murray River, one of Australia’s most socially, economically and culturally significant waterways. The past decade has seen four similar blooms on the Murray River: in 2007, 2009, 2010 and now. Yes, they have garnered press attention, but there has not been the same call to arms that we saw when the Darling River was struck in 1991. It is almost as if such significant environmental events are now simply seen as the new normal. Why the apparent complacency? The 2007, 2009 and 2010 algal blooms on the Murray River all happened during the Millennium Drought, and hence were probably ascribed to an aberration in the weather. In reality, the situation may have more to do with how we manage water in Australia – particularly during periods of scarcity, such as the one we may well be entering now. Those three earlier events all started in Lake Hume, a large reservoir in the Murray River’s upper reaches, originally created in the 1930s to help “drought-proof” Australia. All of the blooms began after the water level was drawn down to below 10% of the lake’s capacity. At these low levels, disturbances (such as when transferring water between the Snowy River and Murray River systems) can easily lead to the mixing of warm surface waters (ideal for bloom formation) with nutrient-rich water at the bottom of the reservoir (ideal for feeding the bloom). The resulting blooms were then released downstream into the Murray River by managed water releases from Lake Hume. The blooms most likely reformed in other constructed water bodies downstream – most notably Lake Mulwala, a shallow reservoir about 250 km along the river from Lake Hume. Lake Mulwala’s principal purpose is to create hydraulic pressure to allow irrigation water to be diverted into farmland in southern New South Wales and northern Victoria. As a result, its shallow depth and mostly still waters make it an ideal incubator for blue-green algae. This year’s algal bloom on the Murray River is different. The main blue-green alga in the current outbreak, Chrysosporium ovalisporum, has previously been reported in the river, but generally in very low numbers. It has never before formed a bloom in the Murray River since monitoring began in 1978. But crucially, this species flourishes in very warm temperatures; overseas blooms of this species have occurred when water temperatures reach 26℃. The other difference between the current and earlier blooms is that, when this year’s event started, Lake Hume was much fuller, at about 30% capacity. So reservoir operation probably had less to do with the bloom’s formation than other factors, such as the climate. Both the maximum and minimum temperatures were consistently above the long-term average during the past few months, as was the amount of sunlight reaching the surface of Lake Hume. We still do not know exactly what triggered this year’s bloom, but if it was indeed a result of unusually warm temperatures, it is very likely that we will see more blooms of this type in the future. Are we really ready for recurrent blue-green algal blooms on the Murray River? These blooms come at a significant economic cost: drinking water has had to be specially treated to remove potential toxins, and the bloom has impacted on regional tourism, coinciding with the Labour Day and Easter long weekends. It also hit farmers, who had to get drinking water for their livestock from elsewhere. More importantly, what do these frequent blooms say about how we manage water in this country – especially as we start to see the impacts of climate change on our environment? Dwindling water could mean more than just drought – it could also fill much of the water that remains with poisonous microbes.